In this first post of a new feature on HumanistLife, one blogger tackles a contemporary ethical concern from a humanist, rationalist or evidence-based position. Below, Laurie Pycroft discusses the smart drug modafinil, and addresses concerns over its use. What if you could make yourself smarter simply by taking a pill? The concept of drugs that improve cognitive functions has been prevalent in science fiction for many years, but only relatively recently has the proliferation of such pharmaceuticals been a serious possibility. “Nootropics” or “smart drugs” have been hitting the headlines lately, with the promise of increased focus, memory, and wakefulness being an appealing prospect for many. Most widely discussed have been stimulants, normally prescribed for medically recognised conditions, being used off-label by healthy individuals seeking to improve their performance at mentally demanding tasks. 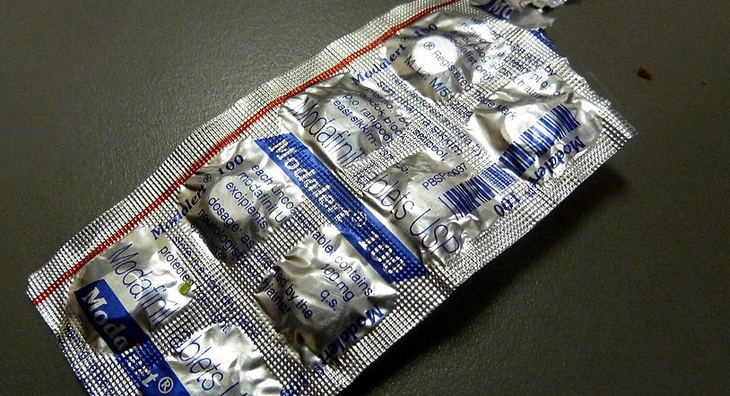 Modafinil (AKA Provigil) is probably the most prominent of these drugs in the UK. Originally developed as a treatment for narcolepsy, modafinil also improves wakefulness in healthy people and evidence suggests that it may improve other aspects of cognitive function in some individuals. As with any drug, however, modafinil has risks associated with it and may be harmful to those taking it. Furthermore, there is a danger of smart drugs having negative side-effects on a societal level. As such, it is important to carefully consider the ethical ramifications of widespread use of smart drugs such as modafinil. This is a substantial question, far too large for this short article to consider in depth, but hopefully this piece will provide a reasonable overview of the issue and pose a few interesting questions worthy of deeper consideration. The first important point to consider is the fact that cognitive enhancement, whether using drugs or other methods, is nothing new. Perhaps the most obvious example is caffeine, a substance that many millions of people use on a daily basis with the intent of reducing tiredness and improving focus. Less obvious are technologies such as computers and organised education, along with healthy diet and exercise, all of which offer substantial improvements to our cognitive abilities. When considering the issue of smart drugs, one should always consider the comparison with established cognition enhancement techniques and remember that all of them have potential down-sides. The important question here is – what amount of benefit does the intervention offer, and is the level of risk associated with it acceptable? Most established cognition enhancement techniques carry relatively little risk, from an individual standpoint. Caffeine is perhaps the best point of comparison for drugs such as modafinil. Caffeine is addictive and can produce unpleasant side-effects, but it is unlikely to seriously threaten health in most people, except at very high doses. Conversely, its benefits are quite minor – primarily improving perceived wakefulness for a short period of time. Modafinil’s benefits are likely somewhat greater, with research indicating that it can significantly improve working memory, concentration, alertness, and other cognitive abilities in sleep deprived individuals. Results are less clear-cut when it comes to those who have had sufficient sleep, but some studies have reported enhancements to aspects of memory and concentration, especially in individuals with a lower baseline performance in the experimental tasks. The negative effects of modafinil use in healthy people are still not fully understood – while it is not associated with the same level of addiction or cardiovascular damage seen with many stimulants, it is thought to carry a small risk of inducing some extremely rare but potentially life-threatening dermatological conditions. Relatively little research has been done into its long-term health effects and future smart drugs are likely to be similarly poorly understood. These risks are compounded by the fact that, currently, modafinil is illegal to sell (although not to buy) without a prescription in the UK, meaning that healthy users must purchase it from underground sources, raising the possibility of being sold impure or mislabelled products. Whether this level of risk is acceptable is, ultimately, a question that each potential user must ask themself. The issues surrounding smart drugs are not, however, exclusive to the individual. Any new technology that has the potential to alter the cognitive processes of millions of people is bound to have effects on society as a whole. Two inter-related societal issues that smart drugs could impact are those of inequality and competition. The inequality issue comes down to the possibility of expensive new smart drugs exacerbating existing social divides – while modafinil is relatively inexpensive and the benefits it offers are modest, it is not inconceivable that new drugs could be developed offering greater improvements to cognition while being substantially more costly. Such a situation could lead to the rich having preferential access to cognition enhancement, making it even more difficult for the poor to compete. While this is a potential problem, it is far from insurmountable. A drug that offered such major benefits could be worth providing for free (or at reduced cost) to the population at large, whether through state health service or charity. This already occurs with education, which requires a vast investment of time and money, but offers such great benefits that society is willing to foot the bill. The competition issue is often raised with regards to education – if one group is able and willing to take these drugs, do they have an unfair advantage over those who do not? A problem with this line of reasoning is its comparison of education to a zero-sum game such as competitive sports. In sport, if one person has an advantage, everyone else is negatively impacted as they are less likely to win. In education, however, the goal is not to “win”, but rather for everyone to learn as much as possible, with a better educated workforce tending to benefit society as a whole. There is still the issue of perceived competition and coercion – if society gets to the point where most people are benefiting from smart drugs, those who are not taking these drugs may feel pressured into doing so. Is this fair to those who, for issues of health, ethics, or religion do not want to ingest these drugs? If not, is the unfairness sufficient reason to restrict smart drug usage in the whole population, or to pass legislation preventing employers making hiring decisions on basis of smart drug use? This coercion issue becomes more complex still when considering those whose job performance can seriously impact others’ lives. A recent study headed by Prof. Barbara Sahakian at Cambridge suggests that sleep deprived doctors may perform significantly more effectively at certain cognitive tasks after taking modafinil, and therefore could be more effective at their jobs when taking the drug. In an ideal world doctors would always get enough sleep, but in the real world modafinil may offer a way to reduce medical errors and improve the lives of patients. If this is the case, should doctors be encouraged or even required to take modafinil when tired? One can extend this reasoning to other professions that are relied upon to make important decisions when deprived of sleep, such as pilots and politicians. Is the risk of side effects outweighed by the risk to patients, passengers, and citizens posed by cognitively compromised decision-makers? As with the public debate surrounding many drugs, both legal and illegal, the discussion of smart drugs is often typified by moral panic, political posturing, and a poor understanding of the science involved. News outlets are often content to discuss amazing miracle-pills or evil mind-destroying drugs, without seriously considering the risk/reward ratios of putative cognitive enhancers, and how they compare with existing methods. If modafinil and similar drugs continue to become more popular, the individual and societal ethical issues surrounding them will grow in importance. A sober and rational consideration of these issues is critical if policymakers are to make informed decisions on the topic, rather than simply following the knee-jerk reaction of the tabloid press. The questions posed above aren’t trivial, but finding acceptable solutions to them could be highly beneficial to society; if modafinil and future smart drugs can be harnessed appropriately, many people would be able to perform better at their jobs, be more productive, and have more fulfilling lives. Hopefully the novelty and potential risks of these drugs won’t completely overshadow the potential benefits.